A fleet of three Black Hawk helicopters, stationed at the base, provides air security around Area 51. More accurately it is the Sikorsky MH-60G Pave Hawk, a newer version of the Black Hawk. 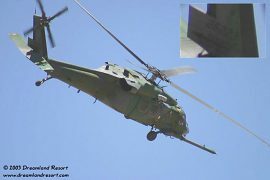 However, since the term Black Hawk seems to be more established we will use it here. The original US Army UH-60A Black Hawk first flew in 1974, and the MH-60G Pave Hawk first flew in 1982. It was modified for the US Air Force with additional fuel tanks and a retractable in-flight refueling probe to increase its range from 600 to 900 km, or unlimited with air refueling. The probe can be seen in the photos below sticking out in front of the cockpit. It is often mistaken for a large gun by visitors to the area. Click here for specifications of the MH-60G. 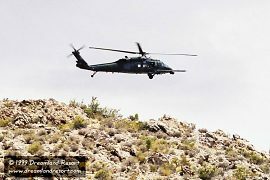 Several times daily the Black Hawk Helicopter can be seen doing its rounds out of the base and across Tikaboo Valley, patrolling the Area 51 perimeter. In the early 1990's it was frequently used to "sandblast" visitors to the area, to scare them away (on public land!). Today this obviously illegal procedure has been limited to very rare cases, when curious tourists explore sensitive areas where it is difficult for ground-based security to keep track of them. One such area is Roadblock Canyon, where access to the old trail up to Freedom Ridge has been blocked by an artificial rockslide blocking the road in a canyon. Of course access to Freedom Ridge is no longer possible after the 1995 land withdrawal, but for several reasons it is still a rather interesting (and sensitive) area. It is very easy there to disappear from view of the watchful eye of the Cammos. The first photo below was taken there with a regular 50mm lens. Ogden ALC is part of Hill AFB, UT, which seems to have some kind of connection to Groom. Ogden uses the tail code "HAFB" for fixed-wing planes. Please let us know if you see any planes with that tail code in the Groom Area. Note the four letter code, as opposed to the usual two letter tail codes (like HI and HL for other units of Hill AFB). Primary Function: Infiltration, exfiltration and resupply of special operations forces in day, night or marginal weather conditions.